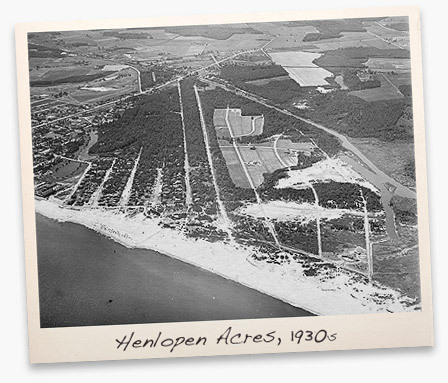 Henlopen Acres in Rehoboth Delaware is one of the smallest incorporated towns in Delaware. Known as a small exclusive community of 381 residents,the town was incorporated in 1970, but developed in the 1930’s by William S. Corkran.The community is bounded by the canal , Atlantic Ocean, and North Rehoboth. The setting is picturesque with wide tree lined streets, marina, and an assortment of homes ranging from modern to Victorian. Many of the owners in this community are year round residents and play an active role in the communities success. The town has its own security/police force, government offices, all run by its elected residents.. Henlopen Acres in Rehoboth is one of the most sought after communities in Delaware. Surrounded by the beautiful beaches, fantastic dining, and wildlife make Henlopen acres a retirees /second home owners paradise. The location of Henlopen acres with its limited access points to traffic give the community a tranquil relaxing feeling even during the summers peak season. Henlopen acres Homes are in demand due to its perfect location and large lots which enable construction of large magnificent homes. The property owners can stroll the pristine beaches all the way into Cape Henlopen State Park. The Park is located in Lewes, Delaware which is the first town in the first state. Just north of the park is the Cape May /Lewes Ferry which transports folks and their vehicle between Cape May , N.J. and Lewes, Delaware. To the south of Henlopen acres is the famed boardwalk and Rehoboth with all the restaurants, rides and souvenir shops to please all shoppers delights. Further south is Dewey Beach , which is a favorite spot for the local musicians,and nightclubs. Here are a few of the homes for sale in Henlopen acres.